What is Rise of Civilizations? - Rise of Civilizations is a free to play mobile MMO game inspired by world's history, developed and presented by Lilith Games. Experience the world's first true real-time strategy (RTS) gameplay in this epic strategy game featuring unrivaled degrees of freedom. - Gameplay is so dynamic that you can do whatever suits your battle style! - The time has come! 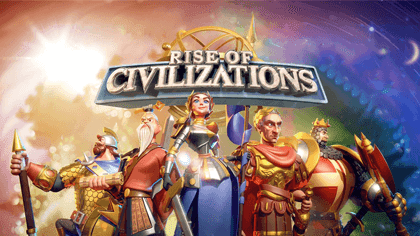 Rise of Civilizations is now available globally on both iOS and Android. Download now and start building your great kingdom, lead your armies, and conquer the world! - Choose from one of the historical civilizations (currently have 8) and guide your civilization from a small clan into a great kingdom. 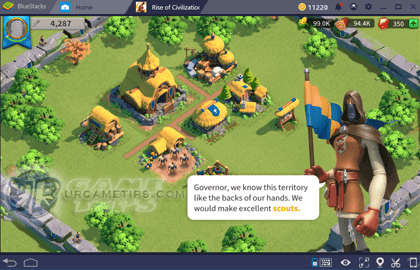 - Summon historical figures who will serve as your kingdom's battle commanders, level them up by defeating barbarians and sending them into battles, then upgrade their abilities using an RPG style talent tree and skill system. - All great civilizations begin with a few wise decisions ~ build a city, store resources, train an army, and research technologies. The fate of the people is now in your hands! - Discover the enormous world of Rise of Civilizations by dispatching scouts to explore all mysterious lands. Investigate lost temples, barbarian fortresses, mysterious caves, and tribal villages to get all of their treasures within. - Dispatch troops to collect resources like food, wood and stones from a nearby areas and defeating a few barbarian clans along the way. Note that, forces can also be split up between multiple commanders so that you can engage in multiple actions simultaneously. - Join an alliance asap to help one another using all features available. Fight alongside them to take control of this vast kingdom. - Alliances can expand their territory to gain resources, capture mountain passes and barbarian outposts to strengthen their position, and work together to unlock group achievements. - Clash with other players and use superior tactics to emerge victorious in this MMO strategy battle royale. Rise to the top and you and your civilization will be written down in your kingdom’s history! - Any civilization can be effective depending on your playing style and if done right. Here are some tips that you might want to consider when choosing a civilization to play with. Note that these are just my opinion and is limited only to the ones available during this review. - This is my personal favorite because it is cavalry based with fantastic bonuses for your cavalry units. Overall it's a powerhouse faction because of it's faster troops training and increased Action Point regeneration, allowing you to fight (faster XP) and/or farm (faster resource gathering) much better early on. - Germany's Commander Hermann is kinda lacking though but still usable early game. - Rome is a great choice if you like playing with infantries. Overall, bonuses are mainly focused on your infantries' defense, marching speed, and more. - Rome's Commander Scipio is also a great unit for attacker type infantries with defense and speed bonuses. 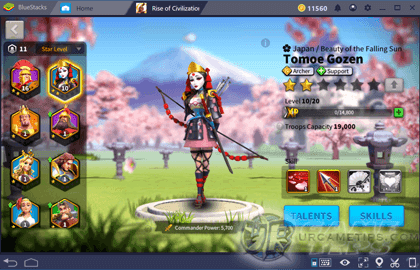 - Japan is also a great choice that can increase all of your troops' attack, a good buff for all around use. Abuse your scout's increased marching speed to map out the world a lot faster early on while gathering some freebies. - Their increased troops training capacity is also a nice touch for casual players that doesn't have enough time to login and play. - Japan's Commander Kusunoki is a decent unit to start with. - Britain is nice choice for players that prefers an archer based civilization, bonuses are focused on archers which is good, but there are some not so useful bonuses like wood gathering speed and 20% increased ally garrison capacity though. - Britain's Commander Boudicca is a decent unit and also a great jungler (good at dealing with Barbarians). - China is also a nice choice, a civilization that focuses on almost everything, like a jack of all trades. It's increased building speed is a great buff that could help you progress faster, while its Defense buff can reinforce your troops to survive longer. - China's commander Sun Tzu is an awesome unit for early game, would highly recommend focusing on infantries with him. - I haven't tried them personally but based on observations and comments from experienced players, these 3 are the least popular civilizations because of their limited bonuses. - Still playable though as long that you know what you are doing, but for beginners, I would recommend the above civilizations instead. - Commanders can be used for gathering resources, fighting, or for defense mode. You can check your commander's passive attributes (Leader, Support, Gatherer and more), together with their active or passive skills, to give you an idea on how to use them effectively. - The commander's number of Stars determines his or her maximum level and skills that can be unlocked. - Once you reach Lvl 20 and upgrade your Commander to 3-Stars, you can unlock a Support Slot (set it up while setting up new troops, check the new slot next to your commander), where a second commander can be selected to aid your leading commander in battle. - Note: Your second commander's Talents will not affect your army, so it's better to only focus on their Skills instead. 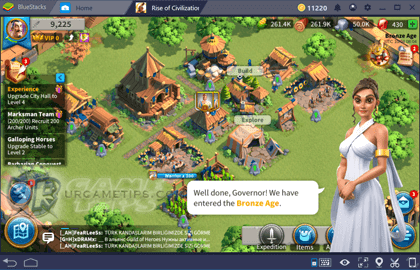 - Here's a quick guide on how to play Rise of Civilizations using the best Android Emulator. - It is also a popular method to get more play time and enjoy the game with wider screen, better graphics, smoother gameplay, and without having battery problems. 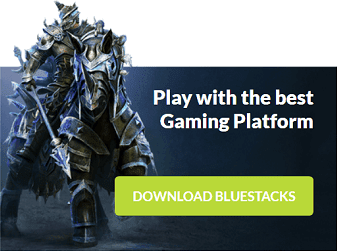 - Join over 300 million people playing their mobile games on their PC using BlueStacks! 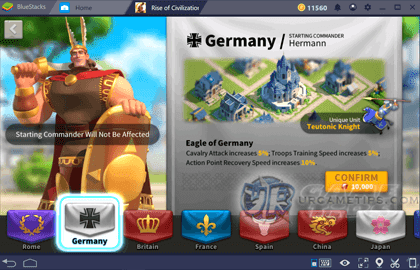 - Next, just click on the Game Icon below to redirect you to the Rise of Civilization page, then click on the "DOWNLOAD" option to directly install the game to your Bluestacks ~ easy! - Open the Keyboard Control UI (keyboard icon, lower right area) anytime while playing to set Hot Keys for your game. - Use the "Eye" icon next to it to adjust the visibility of your keys. - If want to play your Mobile Game from Bluestacks to your Phone/Tablet, make sure to link as well.